As many readers may be aware NOKIA has provided the Iranian regime with a "monitoring center" that enables security forces to tap cell phones, scramble text-messages, and interrupt calls. NOKIA's new surveillance system has enhanced the regime's ability to crack down on dissent during recent protests. Given that NOKIA has made it much easier for the Islamic Regime to crack down on Iranian dissidents, I was quite surprised and disgusted to find out that Mansour a well known and popular singer was going ahead with a previously scheduled concert at Club Nokia. The concert took place last night Saturday September 26th 2009 at Club NOKIA in Los Angeles. 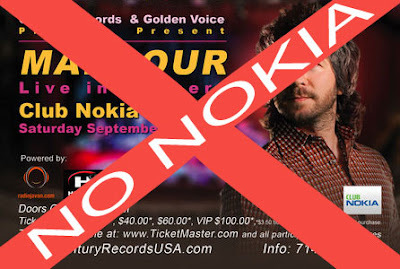 According to “Boycott Mansours’ Concert at Club NOKIA” web page on facebook freedom loving Iranians protested in front of Club NOKIA, and many more Iranians boycotted the concert. I have always been a huge Mansour fan, I attend his last two concerts in Toronto, not to mention many of his CD’s which I’ve bought. However by holding a concert as Club NOKIA Mansour has made it clear that he does not care about Iran and Iranians. He has held a concert at the expense of the blood of young Iranians who are fighting for freedom in Iran. I for one will not forget this betrayal and will never attend another Mansour concert or buy another one of his CD’s. I know many other Iranians feel the same, artists need to know that betrayal of the freedom movement in Iran will not be tolerated by Iranians abroad. Ghods Day-A Nightmare for the Islamic Regime?